I've tried her on and she's so soft and fun, I say go for it especially if you've waited weeks! I got her the moment I saw her and am in LOVE! I seriously wear all the time and don't really care what anyone says! :) She's the most amazing $60 coat I've ever bought! Only advice save the extra buttons - one has already fallen off mine but an easy fix! :) DO IT! Oh good to know!!!!! I think I need to just get her! She arrived on my doorstep this past Monday! 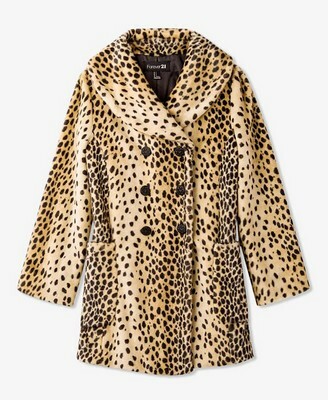 I've always had great success with jackets and coats from F21, and they did not disappoint with this beauty. Two things - the lining is not the best, so some extra care is needed putting it on just to make sure nothing rips by accident. And like Kate said, I'm not a fan of the buttons, so I'm headed out this weekend to find replacements. But yes, super easy fix for a great item! Urban and Asos both have a version too. Happy shopping! Did you pull the trigger?!?! I did it and I'm glad I did. Hubs likes it. I watched the one I bought for awhile before I took the plunge. The sale price was to good to refuse. ASOS - $56.36, free shipping. Gorgeous coat and it looks expensive!